We've all been surrounded by food because we all go to grocery stores (although some of us take much more delight in this chore than others). But have you ever found yourself surrounded - truly surrounded - by people who love food? Well, let me tell you - it is a wonderfully affirming feeling to walk amongst people who are just as obsessed as you are with all things culinary - and beyond that, all things healthy. Because I am part of a Health Blogger network called Wellsphere, I was recently given the opportunity to attend the American Dietetic Association (ADA) Food and Nutrition Conference and Expo held here in Boston as a member of the media. It was not only my first time being a member of the press, but also the first time I had an official piece of paper with "Freelance Writer" written under my name. That is one piece of paper I will not be letting go of for a very long time. After a stop in the press room - partly out of curiosity, it being my first time in a press room - I decided to head to the expo floor before the talks I wanted to see in the afternoon. As I stood at the top of the escalators and looked down at the expo floor, I gazed at booth after booth spanning in every direction, with people spilling out of the aisles, carrying one, two, sometimes three bags full of samples and papers. This was big. The program for this conference was a tome, and quite overwhelming. I wanted to go to everything, but it all seemed to be happening at once! The most interesting talk I went to focused on celiac disease and the newest research about it and gluten intolerance. Did you know that while 1 % of the population is estimated to have celiac disease, there is an additional 6 % who likely have a non-celiac gluten intolerance? Those are huge and alarming numbers, when you think about it - particularly as most of the people behind the statistics are not being diagnosed. Many may continue to struggle with their symptoms for years before they discover how to feel better - if they discover it at all. It is so important to raise awareness so those people can live healthier lives. And after all of the other speakers had spoken, and we had sampled all of the food on the expo floor, we all came together at the end in the largest hall I think I have ever been in, and listened to Anthony Bourdain's parting words. From his opening proclamation ("I don't know if I'm really the right person to address a conference with the word 'nutrition' in it..."), he was funny, amusing, and charming. He talked about our increasingly globalized world and how to be a citizen of that world, even when (and especially when?) we are doing something as routine as eating (particularly in parts of the world where eating is sadly not as routine as it is for us here). He talked about having respect for where food comes from and the central role it plays in families and cultures. And he talked about food itself, and the joys of the perfect meal prepared in just the right circumstances, even if they may also be the (seemingly) least glamorous of moments. He was preaching to the choir, of course. We loved him. In between conference talks, I wandered around the food expo, past representatives thrusting bags of almonds, pistachios, baked chips, and dried fruit into my bag. They offered me brownies and gluten-free macaroni and cheese; avocados and chocolate tortilla chips (no kidding - look here. They are really, really good.). I drank shot-sized samples of hemp and almond milk. Simply by following the crowd, I found myself in the line for a book signing for "The Food Cure for Kids: A Nutritional Approach to your Child's Wellness." The same thing happened to me an hour later with a different book. After shaking hands with the author, I tucked the book into one of my (now several) bags and continued walking, searching for what, for me, was one of the main draws to the expo. Yes. The Gluten-Free Pavilion. Where I spent every spare minute at the conference. While I was wandering around the Gluten-free Pavilion, I was lucky enough to meet the author of one of my very first gluten-free cookbooks: Carol Fenster! 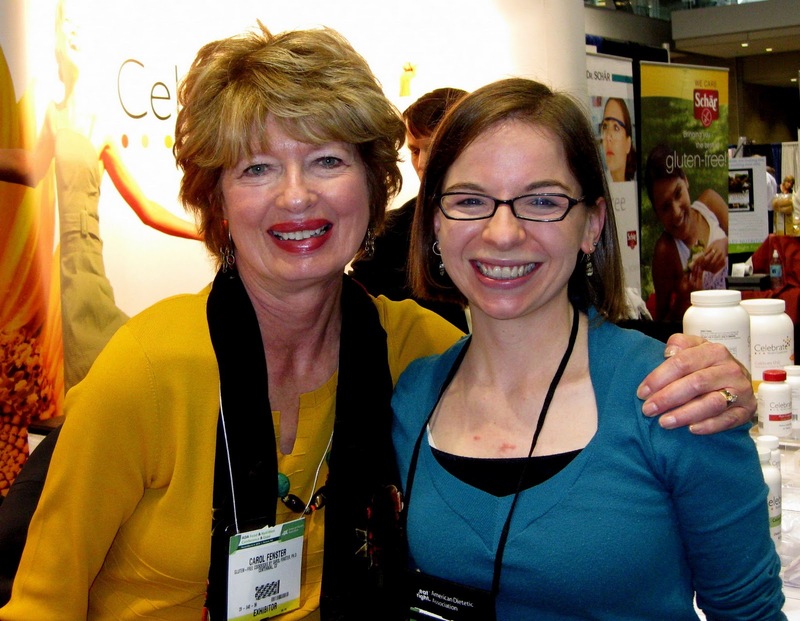 She was there to promote her new cookbook, 100 Best Gluten-free Recipes. It was amazing to meet her, and I even got proof that I did! What I remember most from the encounter is thanking her profusely for her focaccia recipe, which completely changed the course of my experience with (and trust in) gluten-free bread, and then snapping this picture before becoming aware of the crowd forming behind me, eager to meet Ms. Fenster as well. Many thanks to Wellsphere for sponsoring me to attend the ADA Food and Nutrition Conference and Expo! Official conference information (and information about the ADA) can be found here. Find out more about Wellsphere here. I was lucky enough to taste many products that I had not had a chance to try before (many of you know that some of these products can be quite expensive, and I am always wary of spending $5 on something if I don't know what the quality is!). Here are some of the things I sampled, with a quick review of each. Amy's Macaroni and Rice Cheese Pasta, Rice Cheese Pizza, Tamale Verde - both delicious. The macaroni and rice cheese pasta was incredibly creamy and rich, and while I don't know that I could eat a huge portion of it at once, it tasted pretty close to regular mac and cheese. The Tamale Verde was also delicious, with lots of flavor and protein packed into each serving. And the rice cheese pizza was absolutely amazing, with a crisp crust and melted cheese; the sad news, however, is that it is quite expensive (I recently saw them in a local store for $11.49 each!). I don't think I could justify buying one for myself unless it were cheaper, and will simply continue to dream about it instead. Udi's Blueberry and Lemon Struessel Muffins - I enjoyed both varieties, which had a cakey texture. They're expensive, and come in packs of 4, but they are also huge muffins, so I suppose it is a trade-off. I would not hesitate to serve these to someone without a gluten intolerance. However, I think you could make something equally great at home. Udi's Original Granola - This was fantastic. Delicious, flavorful clumps of gluten-free oats with a powerful vanilla flavor - it was hard to stop eating it. The granola has several different kinds of nuts and banana chips, which at first struck me as slightly odd but then quickly grew on me as I continued to crunch through the bag. I took a whole bag home and it was gone within a week. Highly recommended. Kettle Cuisine Chili and Thai Chicken Soup - Amazing soups! The Thai Chicken is a yellow curry-based soup that is extremely rich in flavor, but which still manages to have a light texture. The chili is less outstanding but still delicious. Highly recommended - I would definitely buy either of these! Almond Dream Chocolate and Vanilla Milk - I tried both the sweetened and unsweetened versions of each kind of milk, and because this is largely a matter of personal taste and tolerance for sweetness, it is hard to offer a clear review of each. I personally preferred the sweetened versions of both the chocolate and vanilla almond milk; the chocolate in particular tasted like regular chocolate milk to me. The unsweetened versions tasted.....well, unsweetened. The unsweetened chocolate milk tasted a bit like cocoa powder, and while I wouldn't drink it on its own that way personally, I could see myself using it to bake. Foods by George Brownies - Amazing brownies - decadent and rich, and wonderfully chewy. I believe you could make some good competition in your own kitchen, but for a store-bought kind of day, these are fabulous. Vegan Gourmet Cheese - Quite good - they were making little mini pizza-type appetizers with gluten-free bread and cheese toasted together. It melted quite nicely, which surprised me, and while I still think Daiya Vegan Cheese is my personal favorite, Vegan Gourmet is very good, too. Quick and Easy Grilled "Cheese"